Authentic Keith Brymer Jones original ceramic drawer knob with “his” embossed by hand with a master craftsman’s touch to create a unique impression. Part of the Keith Brymer Jones Word Range. 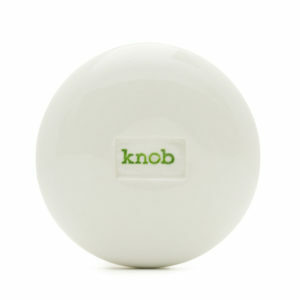 Add a touch of vintage to your furniture with this elegant white ceramic drawer knob. The word ‘his’ has been hand-stamped into the hard-wearing porcelain using Keith Brymer Jones’ distinctive, retro typewriter font. Not just for drawers, these vintage style drawer knobs can be used on cupboards and dressers too. These quirky porcelain drawer knobs are also available with other hand-stamped words, allowing you to personalise your home, find your stuff, or simply mark what’s yours.